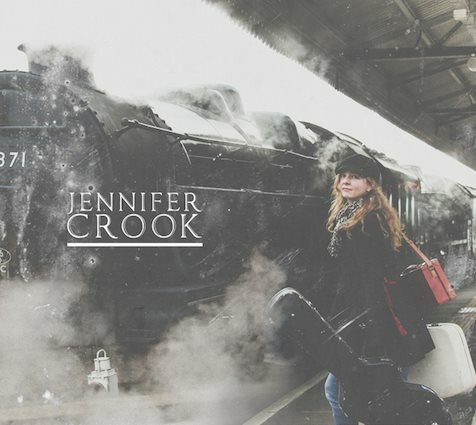 Following a “very impressive” (Pledge Music) crowd-funding campaign, Jennifer Crook’s new album ‘Carnforth Station’ was produced at Real World Studios by Stephen W Tayler (Suzanne Vega, Kate Bush, Stevie Nicks, Peter Gabriel) and mastered by Stuart Bruce (Lana Del Ray, Sheila Chandra, Loreena McKennitt) with additional recording by Leon Hunt. “Jennifer is a rare talent, creating wonderful atmospheric, poetic songs with gorgeous accompaniment – superb instrumentalists and instruments – especially her own harp and of course featuring her beautiful voice. She even manages to make the banjo cool! These songs are like short stories, photographs, movies. . . truly captivating and magical.” – Stephen W Tayler Journeys and travelling go to the thematic heart of ‘Carnforth Station’ which features Jennifer’s live trio: cellist Bethany Porter (Eliza Carthy Band, Newton Faulkner) and guitarist and accordionist, Mike Cosgrave (Jackie Oates, Jackie Leven), as well as her own outstanding skills on the harp, banjo and guitar. Many of these songs have already become firm favourites at gigs as well as brand new material inspired by their travels. This is beautiful, rootsy, acoustic folk that draws on Jennifer’s varied musical history and influences (elements of trad Irish, bluegrass and alt country) yet remains undeniably English in it’s story-telling. With the combination of great musicianship, and wonderful songs that inspire a genuine emotional connection, ‘Carnforth Station’ is a very special record.